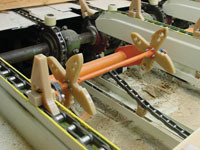 Shark Fin™ is designed to have singulated boards put onto lugs on the grading table and automatically turn the boards over in front of each grader. This is a “no touch” system except where the grader is required to physically put a crayon mark on each board. Shark Fin™ is a totally non-mechanical board turning system not driven by gears, chains, belts or anything else. This system is inertia driven where the board helps to turn itself as it is pushed along the line by the lugs. Shark Fin™ turns the boards for you and it is ergonomically correct. Then it gives the board back to you. You can concentrate on grading instead of material handling. However, you can still touch the board throughout the turn if you wish. Pains in your wrists, elbows, shoulders and back should lessen immediately. Stay in your job longer with fewer health problems and finish each shift with more energy. Sit, stand or walk to grade. You can always touch the board if you want to and you have the opportunity to turn the board to re-grade as many times as necessary. Your job is to grade lumber as accurately as possible. We hope Shark Fin makes this job easier for you. Board Damage from marks, oil or grease are prevented with double pulp safe polyurethane lugs and turners. Organize your grading table simply, inexpensively and with greatly reduced maintenance. Happier, healthier Graders will contribute more to the mills bottom line. Visit the Shark Fin Website for videos and more information. “The equipment started up Monday morning running at an incredible 10% more production and by the end of the day production was almost double that”. Also, “this was one of the few times where equipment installed has done what was expected of it on start up”. “The payback on our board turner project was entirely based on lowering our WCB Premiums. With the shark fin, 6 of our senior graders could come back to work. The minimum estimated savings for us (at the time we asked Alliance for the money) is $100,000/year. Just a quick note to let you know of our status re: the Shark-Fin Board Turning System that we installed in November of this year. If you remember there were some who stated that your system would not work for us because we wanted your system for four graders working in less than 17′ of total space. We pull up to seven grades and our normal product mix covers 1×3 – 1×6, 2×3 – 2×10. I’m pleased to report that your system works just fine and we are very happy. Prior to installation we had problems with graders going on light duty due to injury. Since we’ve installed the board turners all of our graders have returned to work and are happy with the system. In fact it’s the first time I’ve seen graders smile when running 20′ 2×10. 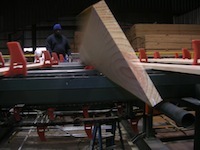 We would like to inform you that the shark fin board turner recently installed at our planer operation has been a great success and accepted by all our lumber graders. The system is so simple and maintenance free. The Worker’s compensation Board visited our plant recently and were very impressed with the system. They asked for our permission to take pictures and would also like to write an article for the monthly magazine. We at the Lakeland Mills would like to thank you for your assistance during the installation. NC, who installed the new equipment at Robinson. He is quoted as saying…”The most important thing that we installed was the patented Shark Fin Turner…which allows one or two graders to look at up to 60 boards per minute if need be” Dugger said “Before, they were only grading about 40 boards per minute” George Robinson (Owner) says…”We basically have a state of the art system that allows the Grader to only take the time to look at the board rather than try to measure the board and do other things. The grader has a lot more freedom and can grade more lumber. 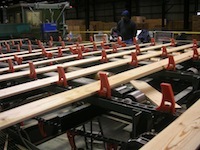 For our company to get the return we needed, we had to get more lumber through our system” Production was boosted from 30,000 to 45,000 board feet per day.